What do you buy for someone who tells you not to buy anything? | Nicki Kinickie Nicki Kinickie: What do you buy for someone who tells you not to buy anything? What do you buy for someone who tells you not to buy anything? I don't know about anyone else but I do sometimes struggle with my relatives when it comes to buying them presents. Not because they are awkward and not because they have extravagant taste but simply because I get told not to buy them anything. My grandparents are extremely guilty of this, are anyone else's? I totally see their logic; at their time of life they genuinely do not need or want for anything. They are happily retired and they have an active social life, they have lived in their house for over 25 years (therefore have all the furniture, ornaments, utensils and house accessories they have ever needed) they also buy themselves anything they come to desire which of course is the reward that comes with working hard all of your life and saving hard too. They have simple tastes and don't want for anything at all. With our first baby due in March they have put their foot down even more so, we have stuff to pay out for and they don't want us spending our money on them. End of discussion. But for me it isn't end of discussion. Christmas is the only time of year I truly feel I get to say thank you for all they do for me. They have been a big part in my upbringing and have always helped me out whenever I have needed it, not only that they have always wanted me around, always wanted me over for dinner, always made sure to phone me and see what I have been up and what is new in my life. Whenever I have popped over there for dinner I have always come away with something whether it was simply a carrier bag of household necessities or some money to put in my car. At Christmas I want to show them that although they think that is their job and they don't want anything in return, I truly appreciate it and they mean the world to me. So, what do I do? I don't want to get them something I know deep down they won't use. A couple of times I have bought them personalised gifts from websites where you can put a photo on a cup or key ring (or pretty much anything!) Their favourite was when I made them a calender for 2011 which had photos of all of us on every month, it is still hung on the wall in their hall today. 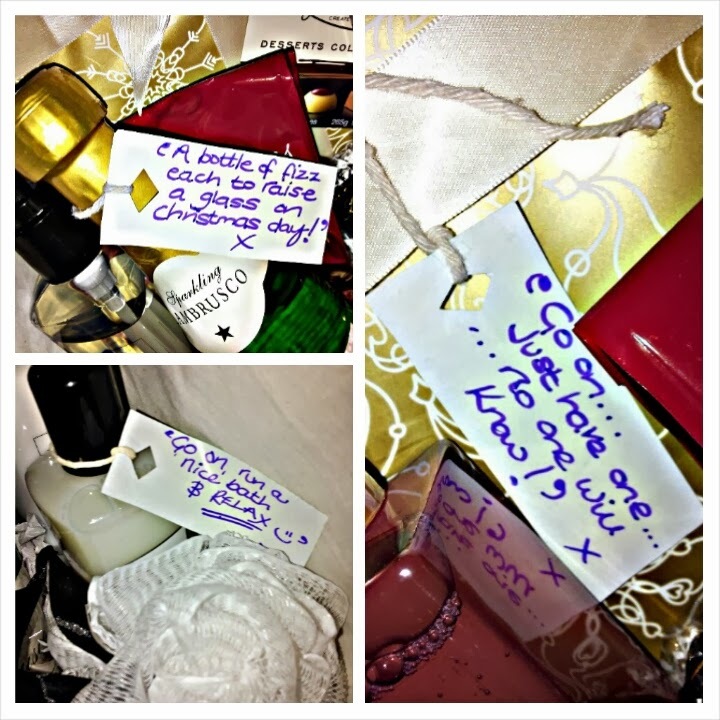 I loved the feeling of getting them something they truly got pleasure in receiving. The only issue with that is you may run the risk of overloading them with photo products and the novelty wears off. I don't want to turn up to theirs for Sunday dinner one day and realise I've kitted their house out with photo mugs, photo diaries, photo coasters, keyrings, calenders and goodness knows what else! My brother who has gone back to college was also told not to worry about a present because of his lack of funds. So when I visited him this last weekend, we had a little think about what we could do that wouldn't cost us too much money (My brother genuinely is skint and we also didn't want them to grumble we had gone against what they had requested) but was special and showed our appreciation. We came up with the idea of a 'Pamper Hamper'. Like me, my nan has long been into beauty regimes (must run in the blood!) so loves moisturisers, smellies and bubble bath so we decided to fill up a basket with this type of item, as well as yummy chocolate and a small bottle of fizz so they could have a glass of something special on us with Christmas dinner. Not only that, after it is all empty they have a lovely storage basket they can use! It's a gift that keeps on giving in my eyes. Most importantly though, they will enjoy the personal element. The fact we have taken time to collect some little bits and bobs, put them together neatly in a nice basket and made it all look pretty and presentable to give to them. To add an extra personal touch, I made some little tags and wrapped them around the odd item with a silly little message such as 'Go on, treat yourself you know you want to!' on one of the packets of chocolates and 'Take an hour, run a bath and lay back and relax' on one of the bubble bath bottles. It's little things like that which make it that little bit more unique and personal. So what have we put in the 'Pamper Hamper' ? Well, a modest selection I must admit and we did well to have a little hunt around and find some lovely little gifts on the cheap. A small packet of Thorntons classic chocolates each as well as sharing packet of Forrero Rocher - all of which came from Poundland. My brother had already bought a bath set ages ago before they even spoke about Christmas so we opened it up to put the items in the basket too. I also had a Ted Baker Bubble Bath which won't be used because I don't have a bath (it was part of a gift set I bought and broke up too) so added that, there is also a box of luxurious chocolates for them to share and enjoy and a small bottle of Lambrusco each. All neatly bundled together and padded out with tissue paper. I did want to add candles for the ultimate bubble bath experience but know for a fact they don't use them - which is a shame! We did also add an eye mask and body buffer though, bath essentials! This way, we have treated them on a budget and have bought them items they are guaranteed to use and want on occasion and not something which will sit in a cupboard. The basket was £7.99 from Dunelm Mill and as I previously said, will be handy for them to use around the house! 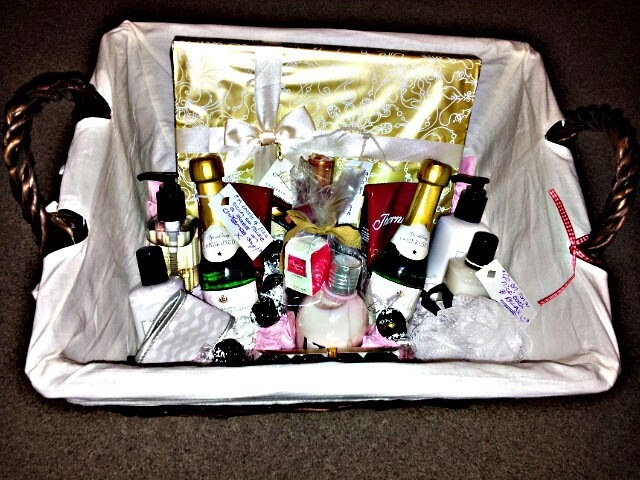 What do you think of our 'Pamper Hamper'? Have you done the same for anyone? It's such a great idea to make for someone you know so well. You can add their favourite vices, tipple and even some little beauty bargains such as lip gloss's and nail varnishes if they like their make up too! Hopefully if you have found yourself stuck on what to buy for someone, this idea will help.